The Black Mouth Pom Cur is a mixture of the Black Mouth Cur and the Pomeranian. This mixture makes for a unique breed. The Black Mouth Cur is a hunter, and the Pomeranian is a tiny companion dog. The Black Mouth Pom Cur will be somewhat larger than a Pomeranian but will generally have long hair like the Pomeranian. The Black Mouth Pom Cur will be about 30 pounds in weight. He is highly trainable and intelligent. The Pomeranian is also very smart and full of life. The Pomeranian often thinks he is a much bigger dog and is not above challenging other dogs. He also has a tendency to bark a lot. Black Mouth Pom Cur is tenacious and courageous. What Price are Black Mouth Pom Cur Puppies? The price of Black Mouth Pom Cur puppies is around $300 to $2,000. 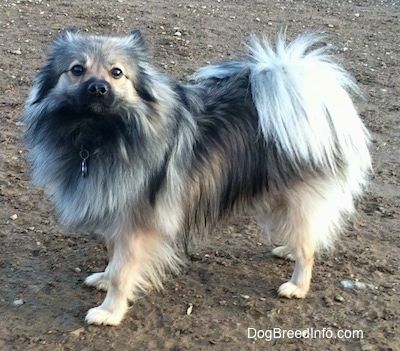 How to Find Reputable Black Mouth Pom Cur Breeders? Responsible breeders only breed healthy, happy, and emotionally balanced dogs. A responsible breeder will be straightforward about health problems in the dogs and will test for health problems that are prevalent in the breed. They will also perform additional tests for other health problems. If you can, visit the breeder’s facility. Check that the kennel is clean, and the puppies should be active and healthy. Weak, dirty, skinny, or malnourished puppies are signs that they are not being cared for properly. This is a major red flag. Puppies need socialization from a young age. Ask the breeder if the puppies have been exposed to children, other dogs, and other animals. Reputable breeders have an up-to-date vaccination record for their puppies, and you should receive a copy of it. If the puppy that you are eyeing has not received any vaccines or veterinary care, you should look for a different breeder, no matter how cute the puppy is. Ask around your community for information about reputable breeders. Veterinarians also know of good breeders in the area. They will even warn you of breeders that breed unhealthy dogs. The Black Mouth Cur parent dog is not one to be indoors. 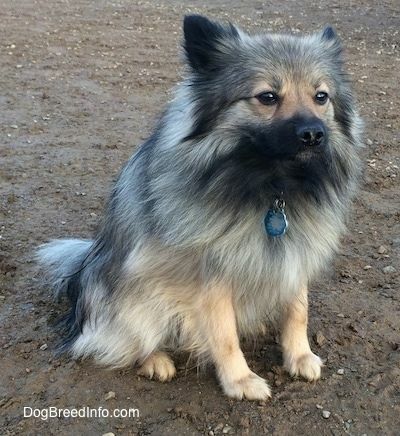 However, when carefully bred with the Pomeranian, you can have a medium-sized dog who’s a great indoor companion. The Black Mouth Cur originated in the southern United States in 1964 when a man named L.H. Ladner shared his breeding records. The Pomeranian parent is distantly related to the Northern Spitz family of dogs. Black Mouth Pom Cur is an ideal hunting and cattle dog. The Black Mouth Cur parent dog is a medium-sized dog. He traditionally has a light tan coat. However, he may present in shades of brindle, fawn, and yellow. The black muzzle is a trademark characteristic. He has medium-sized ears which usually hang. The length of his tail varies. It may be short from birth or longer. He generally has a short coat. While he is an outdoor dog, he does not have a waterproof coat. The Pomeranian parent dog is considered a toy-sized dog. He comes in many colors, such white, brindle, sable, red sable, red, orange sable, orange, cream sable, cream, chocolate, chocolate and tan, blue and tan, blue, black and tan, and black. At its heaviest weight, the Pomeranian parent is often only seven pounds. 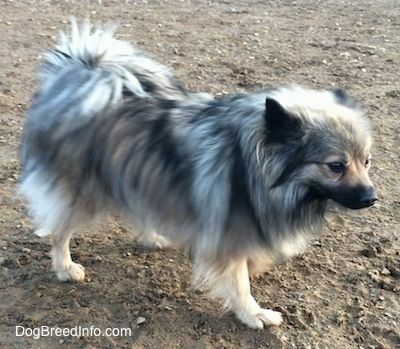 The Pomeranian has a long topcoat and a short undercoat. Considering the genetics of both parent breeds, one can expect the Black Mouth Pom Cur to be about 30 pounds, which is roughly the size of the early Pomeranians. He will be about twelve inches in height and have the Pomeranian’s long and silky outer coat. The coloring will depend upon the Pomeranian parent. But often, he will be a light tan with black markings and a black muzzle. The Black Mouth Cur parent dog has short hair and is quite easy to groom. Weekly brushing will be sufficient. The Pomeranian parent dog has long, silky hair that should be groomed regularly. He also sheds multiple times a year. You can expect a mixture of the parent breed’s feature characteristics on your Black Mouth Pom Cur. Most Black Mouth Pom Curs have longer hair, so he will need the same brushing requirements. Brush their teeth at least three times a week and trim their nails every other week. How Big is a Full-Grown Black Mouth Pom Cur? The Black Mouth Pom Cur can grow to 10 to 12 inches in height and weigh 20 to 30 lbs. What is the Life Expectancy of the Black Mouth Pom Cur? The life expectancy of the Black Mouth Pom Cur is about 12 to 18 years. The Black Mouth Pom Cur is the mix of the Black Mouth Cur and the Pomeranian. The Black Mouth Cur parent dog was bred for hunting, and most experts say he is top of the class. He also works with cattle. He is a natural hunter who is often self-taught when it comes to hunting skills. He may be a tough dog on the hunt. However, with his family, he is kind, loyal, and protective. He is also good with children. His handler must be calm, confident, and authoritative. It is recommended that training begin as soon as the puppy is brought home. He is not to be trusted with smaller animals. It is not his intention to hurt other animals. It’s his hunter’s instinct that causes him to be aggressive toward smaller non-canine animals. The Pomeranian parent dog is considered an extroverted dog who loves other people and animals. However, he believes he is much bigger than he actually is and may challenge other dogs at times. He is alert and curious. He may also be prone to barking. It’s recommended to train him to stop barking on command, and training should begin at an early age. Most Pomeranians that are properly socialized do not exhibit aggressiveness. This also helps with small children, as some Pomeranians are not good with children, unless socialized properly. With all these traits considered, the Black Mouth Pom Cur should also have a vibrant personality. But he will need to be socialized early to become used to small children, strangers, and other dogs. Because both parent dogs can be dominant, it is important to begin training at an early age. The Black Mouth Pom Cur is a perfect mixture of both parent breeds. One can expect him to be curious, intelligent, and alert. Provide proper nutrition for Black Mouth Pom Curs. A good quality dog food with high protein is good for this active breed. Many dog food brands also come in “active formula,” which will provide the needed vitamins and minerals for energetic Black Mouth Pom Curs. Feed this breed in the morning and again in the evening, as his energy level requires more than one feeding a day. Always provide plenty of fresh water 24 hours a day. How Much Exercise Does a Black Mouth Pom Cur Need? The Black Mouth Cur parent dog is a very active dog who typically is not meant to be inside. He has a lot of energy and loves to run and chase prey. The Pomeranian parent dog is a very active dog as well. He needs both mental and physical stimulation. Black Mouth Pom Curs will also need a lot of mental and physical stimulation. Be sure to have lots of toys that mentally challenge him. Games of fetch or tug will be greatly enjoyed. A walk is good for the Black Mouth Pom Cur. Take him to dog parks or let him run free outdoors if you have an area for him to do so. Major health concerns for this breed include Legg-Calve-Perthes Disease, hip dysplasia, entropion, and patellar luxation. Minor health concerns include dental problems. The veterinarian may require your Black Mouth Pom Cur to undergo eye, dental, or physical examinations, as well as internal imaging. Black Mouth Cur parent dogs love to work. They are tenacious and courageous, traits that make them ideal hunting and cattle dogs. They are also loyal, protective, and affectionate with their families. They are trusting, bold, and confident. These dogs are all-around homestead dogs. They take their job of protecting their family and property seriously. But most Black Mouth Curs are not assertive and work great with other dogs, especially if they are well-socialized. The Pomeranian parent dog will make his way to your heart from the start. He is lively, intelligent, and eager to learn. Other qualities include being busy, curious, and alert. These docile, affectionate, and loyal dogs can become ill-tempered and snappy if not handled carefully. The Black Mouth Pom Cur will be a combination of these traits. You need to begin with dog training as soon as possible to help him become more sociable.